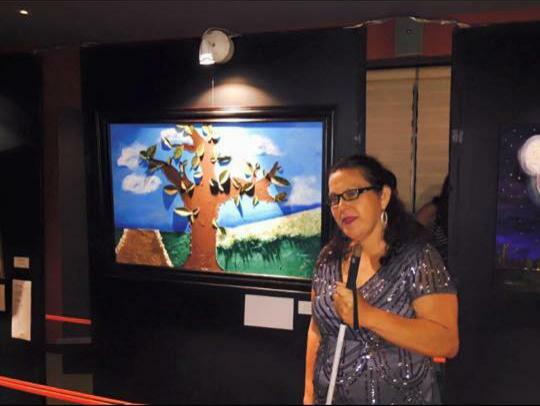 The Rio Grande Valley Chapter’s “Visual Challenges Art Exhibit” raised $5,000 for upcoming NFB-BELL and Silver Bells programs sponsored by the affiliate. The exhibit, which took place Oct. 21 at the Altum Restaurant and Bar, was created in conjunction with the Artists Factory, a local and growing school of art. Macarena Pena, President of the Rio Grande Chapter, and Benilde Gonzalez, the Director of Artists Factory, met in an art exhibit in June of this year. After exchanging no more than 10 sentences, the desire to promote art and equal opportunities for all Texans led to the creation of the art exhibit. 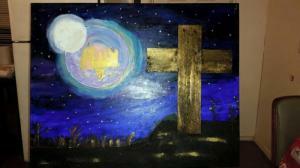 Ten blind chapter members created mix-media paintings rich in color and texture for the display. Daniel Martinez, the chapter’s Vice President, created an ocean-themed painting with tactile elements and strong contrasting colors. Sighted artists got a taste of creating art non-visually for the exhibit. Nine local artists from the Artists Factory created pieces while wearing sleep shades. All 19 pieces were displayed at the Altum Gallery in the dark. The event had two phases. First, more than 250 attendees had the opportunity to explore the tactile exhibit with their hands. Federationists, using long white canes, guided participants through the dark gallery. Daniel bid on his painting and purchased it for $60 to hang in his office, and he plans to bring it to the state convention for others to see. The Rio Grande Valley Chapter and Artists Factory plan to continue their partnership by hosting more art exhibits in the future. Chapter members plan to host the Visual Challenges Art Exhibit annually.